Added unique peer feedback request information to individual lessons and topics. Hello fellow Learndashers, We are writing to introduce three new plugins that we've created to support your mission of teaching/training your clients with LearnDash. LearnDash EZ essay Scoring: Allows you to easily score multiple essay questions in minutes. LearnDash Quiz Question Category Changer: Create, choose, or change multiple quiz question categories in seconds. We made some minor updates under the hood to our Front End Grading and Reporting plugin. Now your learners can see the rubrics you use to score their submitted assignments and essays on the Front End. This is great for accountability and transparency in grading. Please see the image below to see how it works. Students can see the Rubric their assignment was graded by, so they know why they received the score they did. Sign up with your email address to receive our lastest updates. For rubric based scoring you should choose, "Not Graded, no points"
2. Choose a rubric that can guide the scorer on what to assign points to. Important Note: Make sure when setting up the essay question, you added a point value for the question. Go to Dashboard and access your "Submitted Essay" section under courses (LearnDash) and click "Edit". Scroll up and change the status of the question and click update. 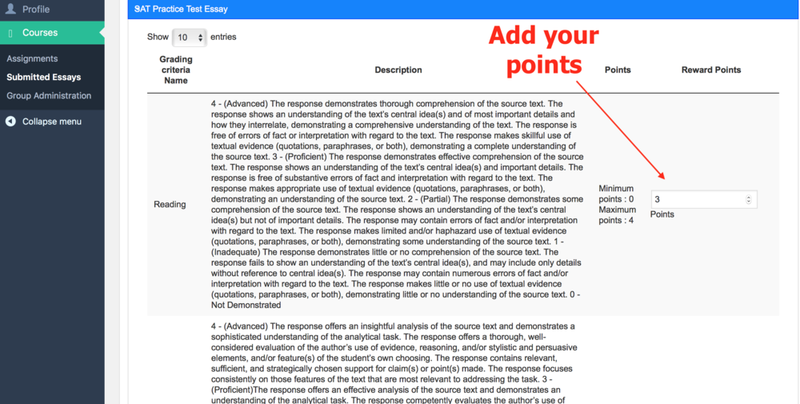 Make Essay scoring more effective and easy to do with our LearnDash Front end grades and Reporting plugin. Give users deep data and printable reports on how they performed in your courses. Include automatic up-sells through recommendations. Empower your users by giving them the information they need for better learning. Hello, we are excited to announce a new update for our Front End Grades and Reporting Plugin for LearnDash which allows users to see if they passed or failed a quiz based on the color of the report. Green for Pass and Red for Fail. We've updated our LearnDash reporting plugin to offer Peer to Peer Feedback. Course Administrators can choose which users can provide peer to peer feedback. Added printable skills and assignment report that can show progress and scores from the skills listed in your rubrics. Great for Skill training that goes beyond a simple assessment. Increased the size of the Course Box on the "My Course progress Tab" so that you can offer additional types of grades beyond letter or percentage. We added a Grade column for the print out of the My Progress Chart. Go to the My Progress section of the report. After clicking the "My progress section" and the grade level you want a report on, click "Extract PDF". Step 2: After you click "Extract the PDF" you are now able to see the grade for the course or subject in the pdf version of the report. This report allows you to offer a report card with the LearnDash LMS plugin and Wordpress. 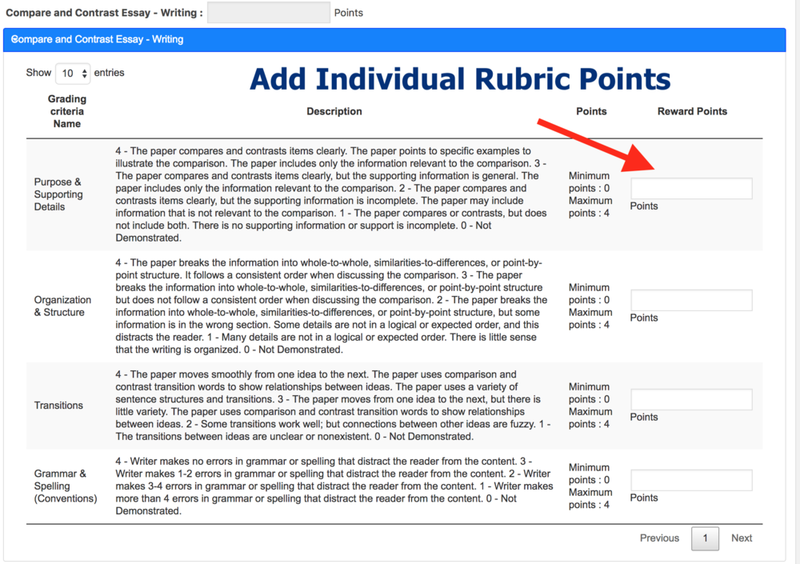 Rubric scoring updates: Now you can score individual skills in rubric scoring for assignments. 1. Learners can now see how they scored in different skills within a rubric. 2. Skill Tracking with LearnDash: Scores from Individual skills in different assignments can be tracked overtime. Example - If you have two lessons that include the skill "Oral Presentation", the scores can be tracked over time to see how a learner's skills are developing. 6. 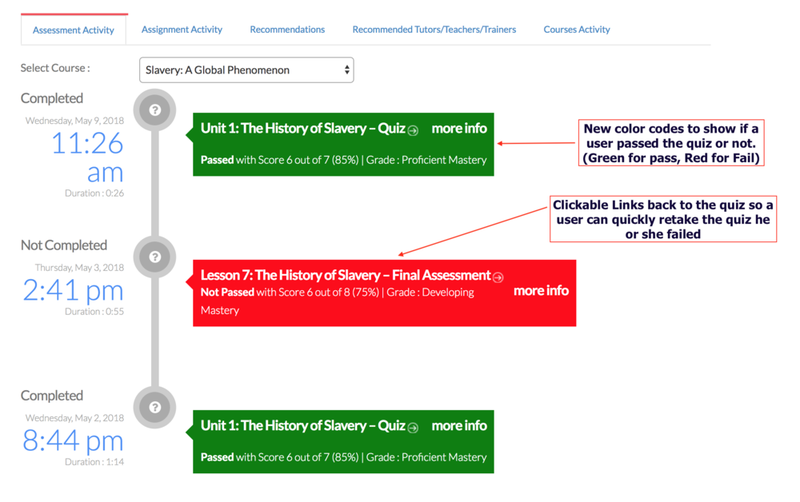 Multiple Scoring Types for Rubric Based Scoring: Educators can use growth mindset, points scoring or any other type of grading philosophy with LearnDash LMS and Wordpress.